This feature is only available if it has been enabled by the administrator. Side conversations are perfect for reaching out to other departments or external partners, but for many teams, they can become repetitive, especially if there’s a specific structure to the initial messages. You may want to use macros to start side conversations and ensure that key information is included automatically when the conversation is started. You can add a Side conversation action to any macro and when it runs, a new side conversation is started and immediately pops open. 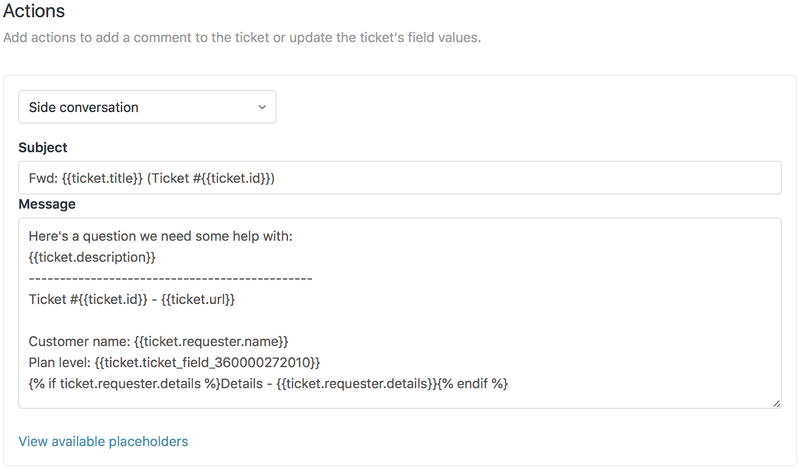 Ticket information and some extra boilerplate are added automatically to the body by means of placeholders, leaving you to add only the recipient and any additional information you want to include. When you use a macro to start a side conversation, the macro won’t be applied to any side conversations that are already on the ticket - only to the new side conversation you're starting now. Keep in mind that your macro may include other actions that change ticket fields. If you don't submit the ticket, those changes will be lost. If you are looking for more information about side conversations, see Using side conversations in tickets (add-on). Anyone (agents or administrators) can create a personal macro for side conversations. Administrators can also create shared macros for side conversations. Click the Admin icon ( ) in the sidebar, then select Macros. Click the All shared macros drop-down menu and select Personal macros. Click the Add macro button. Enter the macro name, and add actions for your macro as described in Building macro action statements. In the Actions section, choose Side conversation, enter a subject, and your message. For the message, add placeholders for information you regularly need or use. Note: Only plain text is supported at this time. You cannot add rich text formatting or images. 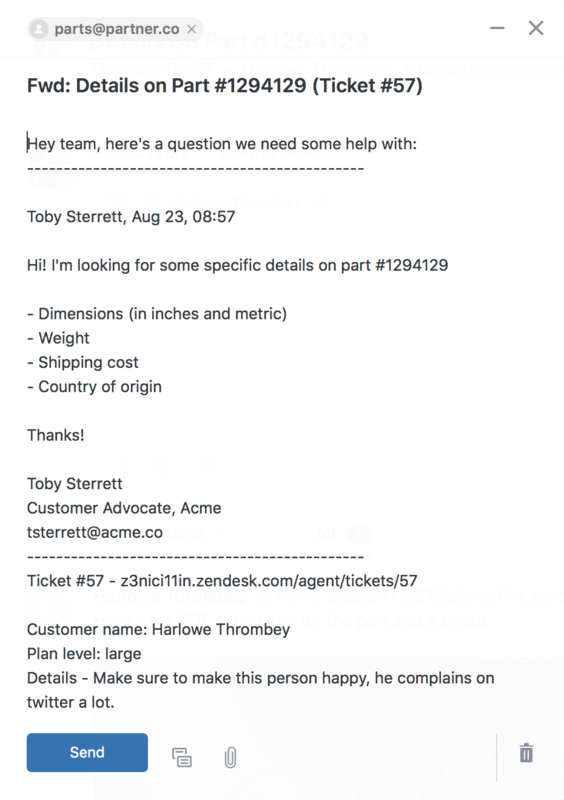 Macros for side conversations create a new side conversation and automatically add ticket information and some extra boilerplate to the body of the message. From the ticket, click the Apply macro button in the bottom toolbar. When the macro with a Side conversation action runs, it immediately starts a single new side conversation with the ticket information and boilerplate text specified by the macro. The side conversation is not saved though until you add a recipient and click Send. Add a recipient to the side conversation. If needed, change the subject of the side conversation and add, remove, or change information in the message. If the macro updated any ticket fields, make sure that you also submit the ticket. Would be great if when adding a recipient - it searches from current users/agents automatically. Or if you were able to automatically add a recipient as part of the macro. @Conza the recipients should autocomplete agents and light agents, but not end-users at this time. Autocompleting end-users (and previous external side conversation recipients) is something we're working on. Out of curiosity, what are the use-cases where you'd send a side conversation to an end-user? Recipients as part of the macro action is something we'd love to do and we're investigating making that happen. Would you imagine most of your side conversation macros would have the recipient pre-filled, or would that only be for special cases? Hi Toby - just to jump in here, we have a few macros that would send a side conversation to a distro list. There would be quite a few of those cases and pre-populating the recipient would be quite useful to us. Happy to expound more on our use cases as needed! @Toby Sterrett - Re: "Autocompleting end-users (and previous external side conversation recipients) is something we're working on." = Brilliant! Very much needed imo. Re: "Out of curiosity, what are the use-cases where you'd send a side conversation to an end-user?" = For us, mostly courier companies. Or alternatively having a franchisee model (and not making the individual stores & all their emails - Light Agents), then the stores. So for instance, customer enquiry about order ETA. We can then contact the store, or chase up courier w/ a side conversation. Or we contact a supplier. Alternatively, store sends a ticket in - advising delay or issue. We can then side-conversation the customer from there, instead of creating a new ticket. Re: "Would you imagine most of your side conversation macros would have the recipient pre-filled, or would that only be for special cases?" = I would be aiming to have them pre-filled, yes. Would be populated with the macro. 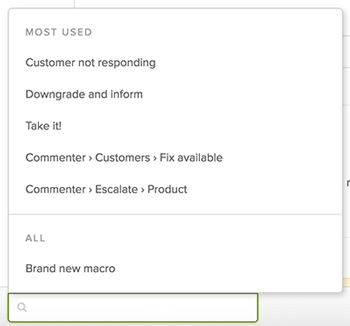 Pasting the text from a zendesk to the side conversation results in a un readable array of character (example enclosed). I am going to spin up a ticket with you to get a better understanding of the issue you are referencing. We can work together in that ticket to see what resolution we can find to help! We also have plenty of situations where we want to "forward" a conversation to an internal user. Adding the recipient to the macro would be great. Is there any way that we can do something like this with triggers? We could save a lot of time automating something like this and take the macro step out completely. Any idea when you can prefill the "To" section in the side conversation by using the macro? (Like we all do know with "Add CC" in macro's?